I was supposed to make these last year, but that didn’t happen. This year it is though. The tasty spiced biscuits generally eaten for the Feast of Saint Nicolas, (Dec 5th or 6th- depending on whether you come from Belgium or the Netherlands) that taste rather good dunked into your beverage of choice. SBS’s Feast magazine has had two recipes for them recently (September and December issues) and both varying slightly with their quantities and ingredients. I stuck with the simpler version and then have since tweaked it to suit me more. These are a really great biscuit to roll up and keep in the freezer, to be cooked at a moments notice. Give as gifts, and also a good excuse to go find yourself a speculoos plank. Yes indeed, a speculoos plank. Even the name is enticing and it’s one of those funky little wooden moulds to pop your biscuits in before baking. The thought had entered my head, and there wasn’t a whole lot of persuading of that thought, that it wasn’t something I really needed. An investment in my future I rationalised. I’ll be making loads of these down the track. I’ll start a new tradition of making them every 6th of December for the family and for many years of Christmas presents to come. See, of course it makes sense to buy one from Belgium for a friend to bring back with her on her travels in several weeks time. So now what to do with my cute little wooden windmill mould? First, it was new,so I needed to grubby is up a bit. Using rice flour to line it certainly helps and after quite some time of working out what works best accompanied with multiple pursing of lips, eyebrow frowns, and the odd whispered intermittent heavy swear word. It worked. Hooray! Biscuit dough back in the fridge to firm up again and then baked. I did it, speculaas have been conquered. Baked for 15-20 minutes until golden and then out they come. Speculaas not conquered. They look different to the un-moulded ones. All that fiddling with the mould before they get baked has caused the butter within to melt a bit, despite firming them up again before baking it, the dough has changed the consistency some what. How do I get them in without that small amount of melty action? The distinct windmill print looks a little more like a chewed dog ear now. So I kept playing and fiddling, using a knife instead of my fingers to get the dough in and moulded around. The final verdict? The biscuit dough recipe is tasty, easy, and praticle. It works really well for rolled and cut circles, or simply rolled out and cut with a regular biscuit cutter. So I’ll keep playing and tweaking. In the mean time, at least I have something to nibble on while I do so. For baking, cut rounds off on to a tray and bake…. * Or simple roll mixture out and use regular biscuit cutters to get a shape that you like. * They are still perfectly acceptable to be eaten, dunked and given away as gifts in this way. An extra thought– I think the flour to butter ratio needs to be changed a little for using the mould properly… maybe. I’ll keep tweaking anyway and see what I come up with. 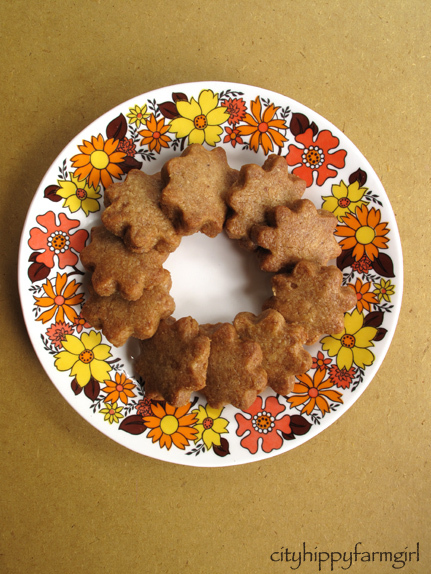 This entry was posted in Food Glorious Food and tagged biscuits, christmas, cookies, easy, Feast of Saint Nicolas, gifts, home made, simple, speculaas, speculoos, spiced biscuits by cityhippyfarmgirl. Bookmark the permalink. Some times it helps things run a little smoother. I am also in love with the sound of a speculoos plank. What a delightful phrase. what a fun post, I did laugh at your comment about lots of swearing! 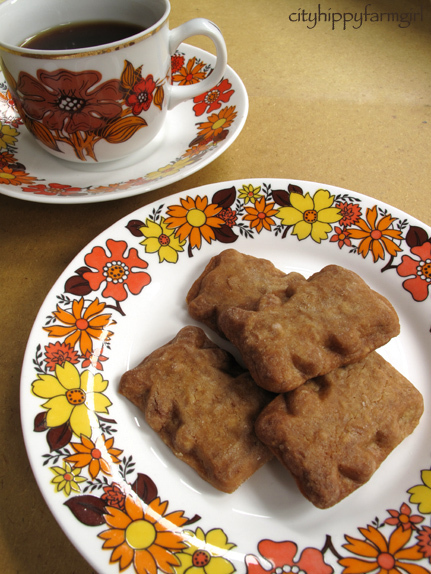 I love the little flower biscuits and wish I had one to dunk in my tea that I am drinking right now! I would happily send you some Chutney and Spice! I am never sure exactly what these biscuits are meant to be but I love the name – I have made lebkuchen this year and they seem very similar – love spicy bikkies – never heard of the moulds but I think maybe you just need to hang them on your kitchen wall – they sound more attractive than practical to me but maybe you will find the right recipe for them. 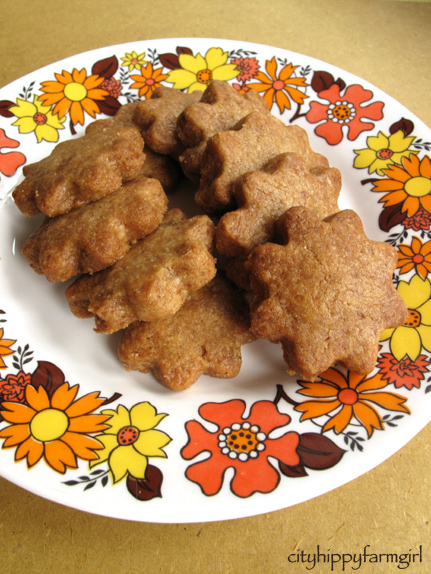 I haven’t made lebkuchen before either, however I have enjoyed eating a few. There is something delicious about any of those spiced biscuits, I’m a sucker for them! I may stick to my star-shaped cutters. Have to let you know that your plates totally match my mum’s bathroom. I remember it being decorated in the 1970’s. PS In case that sound rude, I absolutely love Mum’s bathroom and the plates. So not rude. I could have had tea in your mums bathroom! I swear a lot too when my baking doesn’t turn out right…and when my PC dies. 😀 The biccies look good though, everyone’s making Xmas ones right now, it makes me want to make some too! Ohhh, computer problems and that’s a whole lot of other words that come out. Especially when I know I can do something on there and I can’t remember for the life of me how! I love those plates, retro-tastic! Very retro-tastic! They are a new addition to my kitchen, and I’m rather enjoying them. It is so very the new black. Sigh…I didn’t conquer them either this year, despite my best intentions. I’m looking forward to seeing how you solve the stuck mould problem, I don’t have a solution yet! Your little stars looks delicious and very Christmassy though! Oh how funny, I think a little dose of swearing helps most tricky situations. I completely understand your frustration regarding the moulds. I’ve encountered the same problem using timber shortbread moulds. I used mix of cornflour and rice flour for dusting but the best advice I was given was to freeze the moulds and the baking trays for an hour before use. I think you might be right regarding the butter and flour ratio. My recipe (from a dutch lady) has 250g butter and sugar to 500g of flour. Yum I love these biscuits, looks like I’ll be making some this weekend. Yep, that’s the kind of ratio I’ve been told as well. Thanks Lisa, it’s good to read a back up comment. Yes, that I will C.
Oh, making these was clearly quite an ordeal. I was nearly swearing just reading about your experience. But they do look lovely and I’m sure they tasted amazing. I love the way the cookies and the plate go together so well, especially in the first photo…I keep coming back to this post to see them! Oh- so very well done, Brydie! Never give up on making cookies that you have your heart set on. You will perfect the dough and use the mold with marvelous results- it is just a matter of time. That is hugely disappointing that it shattered Joanna. That would have induced a whole different range of words from my lips. Hahaha, that’s hilarious 🙂 your typo that is. I like the sweating version better! Now as for that mould, where did you get it?? I looked online for far too long to find something similar and couldn’t for the life of me find anything.